Kwik Save was originally a Welsh company and is a supermarket chain that has stores across the U.K. In the early 2000s, the company struggled to increase its profit margin considering the fact that its competitors such as Sainsbury’s and Tesco developed budget brands of their own. On July 6, 2007, it went into bankruptcy and consequently closed a majority of the stores across U.K. As of April 2012, the company was brought back and is currently owned by Costcutter, a convenience store operator. The company was founded by Albert Gubay in 1959 in Prestatyn, Wales. During its founding, it was given the brand name Value Foods. The first company retail shop was rented in July 1959 in Queen Street. Stores that are more conventional were established in Wrexham and Chester. The “baby shark” model of retailing was adopted in the 1960s. The model entailed purchasing a few lines on payment terms that were favorable and then selling or distributing them at or less than the cost prior to the payment date. The interest was then used in business funding. The company name was changed to Kwik Save Discount in November 1970. In 1998, Kwik Save merged with the Somerfield group, thereby operating as Somerfield Stores’ division. The merger saw the re-branding of the discount supermarkets of Somerfield’s Food Giant as Kwik Save. 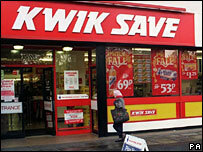 The Kwik Save brand, as well as 171 stores, were later sold to investment group BTTF on February 27, 2006. The BTTF company name was dropped and replaced with Kwik Save Limited. However, the company was placed into administration again on July 6, 2007 leaving it with only 56 stores. These 56 stores were subsequently transferred to a new company, FreshXpress.